2/2 I love you, care about you, worry about you, we laugh and cry together. Without our relationship in my life I am not sure I will cope. Gotcha Under Attack Genuine LOL Anyone Fancy A Leveson Inquiry Cakepop? 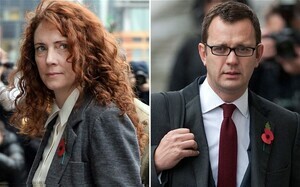 Posted in Misc and tagged Hacking, Rebekah Brooks at 4:02 pm on October 31, 2013 by Broadsheet.